There are a few different ways to set up and maintain your mortgages and loans on Stessa. Choose the best method for your situation. You'll want to make sure all mortgages and loans are set up accurately so that your Property and Portfolio dashboards reflect the correct loan-to-value ratios and debt totals across your holdings. If your mortgage is held by a financial institution that's supported by Stessa's automatic data connections, it's best to link the account first to see how much data is available. Some financial institutions only provide basic loan details like balance and payment amount while others will also provide the interest rate and detailed transactions data for actual payments. If you've connected a mortgage account and the link appears valid, then you can easily fill in whatever information might be missing. Navigate to your Property dashboard and scroll down to find the "Mortgage" card for the correct loan at lower right. Click the small edit button in the upper right corner and fill out whatever information is missing. Click "Continue" to save your updates. In the event that your mortgage payments for a linked account are not automatically populating on your Transactions page, the best practice is to link the checking or other bank account from which you pay the mortgage. 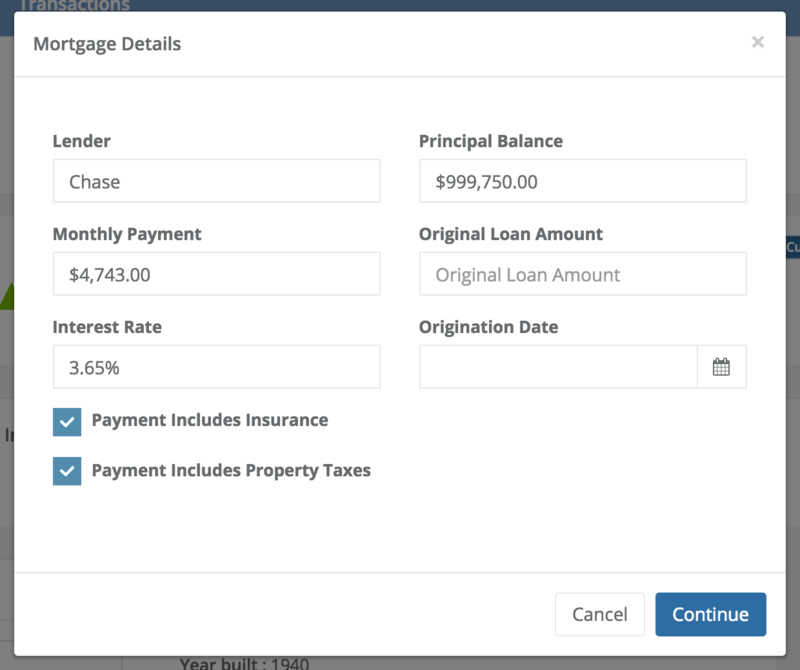 This workaround will capture the payments on the outbound end, which you can the categorize as Mortgage Payments for accurate reporting. Mortgages and other loans can be manually added and updated on your Property dashboard. To add a new mortgage manually, find "Mortgage" on the "Pro Forma Expenses" card. Click the "+ Add" link in the righthand cell and then enter the basic details for your loan. If the Mortgage line item is missing from your Pro Forma Expenses, scroll down to the "Loan-to-Value" card and click the small gear icon to "Add Loan." If you're also missing the Loan-to-Value card, you can get it back by clicking on the small gear icon to the far right of "Property Details" near the Property photo. Select "Edit Financials" and key in a number for "Loan Amount." Previously entered mortgages, are managed via the "Loan-to-Value" card at lower right, below "Capital Improvements." 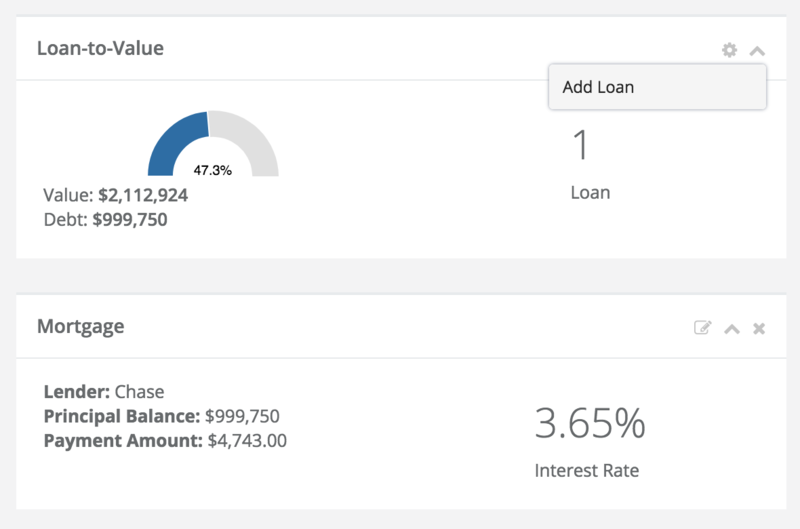 To set up a mortgage or add an additional loan, click the small gear icon in the upper right corner of the card. Select "Add Loan" and enter in the key details. If your monthly payment includes an escrow for taxes and/or insurance, check those boxes so that your Pro Forma Expenses card will update properly. For "Principal Balance," you'll want to enter in the current balance or a close approximation. In the scenario in which you successfully connect both a mortgage account and the bank account from which you pay the mortgage, you may end up with duplicate transactions. We generally recommend simply deleting the transaction flow from the mortgage account if you're already capturing the outbound payments from the bank end of things. Here's how to do it efficiently: Use Bulk Transaction Edits to Save Time. As an alternative, you can also set the mortgage connection to "Exclude from Stessa" via your Data Sources page. This will stop the transaction flow from being imported into your Stessa account altogether. Stessa does not yet support portfolio mortgages that cover more than one property. We do plan to develop this feature in the near future. In the meantime, it's best to simply allocate the portfolio loan balance among the various properties and set up corresponding individual mortgages. If your portfolio loan is amortizing, this may be a lot to track every month, so we recommend simply adjusting your principal balances quarterly or annually instead. Still have questions about setting up and editing Mortgages? Use the blue circle at lower right to drop us a quick note. We'll get back to you shortly.